Here is my entry for the latest Food Fight hosted by The Pragmatic Chef. This was a fun one because everyone submitted a favorite recipe and then the recipes were randomly assigned to the participants. With the luck of the draw, I was to make Matt’s “Melonhead’s Venison Salad”. First off, I didn’t have any venison, but I did happen to have some elk that I picked up from Exotic Meats. Never having eaten elk before, I was surprised by how dark the meat was and by the thick striations. It resembled flank steak, so already I was thinking this might be one very tough cut of meat. I didn’t slice the fillets as directed because I wanted to treat them like steak and have a little color in the middle. I rubbed them down with salt and then olive oil and seared both sides over med-high heat. I didn’t have any fresh peppers so I threw in a dried hot chili and then two cloves of minced garlic. Next came about a half cup of chunky peanut butter. I plopped the peanut butter into the pan and quickly realized that this wouldn’t work. Things were starting to burn and the peanut butter remained in a ball no matter how hard I stirred. I was picturing a creamy sauce, so I added almost a cup of water to get the consistency I wanted. It tasted like something was missing so I added a tablespoon of roasted red chili paste. The sauce was now perfect, but it was difficult making the sauce with the meat still in the pan; next time I’ll remove the meat after it’s seared and then make the sauce. 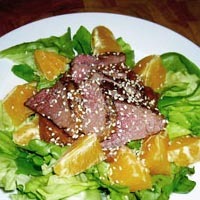 I let the elk rest while I prepared a simple salad of butter leaf lettuce and orange slices. I topped the salad with a little of the warm peanut sauce and thick slices of elk meat. I had forgotten to add the sesame seeds to the sauce, so I settled for a sprinkling on top. My first bite of elk had me in disbelief over how tender it was; it was like eating an exceptionally good filet mignon, but with so much more flavor. The meat was rich, but not gamey and almost had a sweetness to it. The elk was assertive enough to stand up to the strong sauce and paired wonderfully with the spicy/salty/sweetness of the peanuts. Delicious and unusual… thanks Matt, I will be making this one again! Elk that turns out tender? How unusual—I’ll have to try it this season since there’s a herd living across the street. So that’s interesting… I’ve never tried elk before, so it usually IS tough then? That was what I was expecting, so I was shocked by the tenderness. I wonder if what I ate was a special cut or breed—I didn’t pay enough attention to the packaging to remember. That’s very cool that you have them living across the street!! Your Roasted Chicken Masala looks incredible. You have to tell me more about balut… did you enjoy it? Hmmmm. Sounds interesting. I think I’d try the broth part—not entirely sure about the bird part though… but mostly because of the bone issue. I would never have thought peanut butter and elk could be good…Im so happy to hear it was! Haha! The chicky isn’t for everyone ;) There is actually a restaurant here that serves something called Balut Surprise which you can order without the chick. They thicken and season the soup a bit (making it heartier and a bit spicy) and cook it in a bowl with a flaky pastry crust on top. Yes, at first it sounded so odd, but the finished product ended up a lot like a fantastic satay with peanut dipping sauce. Oh, and fourteen orders of miso-glazed eggplant??! You go girl. Balut Surprise sounds really, really delicious. Do you happen to have a recipe? I hope you do try recreating the dish—and then share the recipe with me! I found out that the cut I had was the equivalent of a fillet mignon—so it was exceptionally tender, yet still VERY flavorful. I can’t wait to try it again. Look up http://www.Imbetterwithfood.com for recipe on Balut. look up also asiacuisine.com for item on Balut. Good Luck, I’ve tasted this dish recently, it’s different.